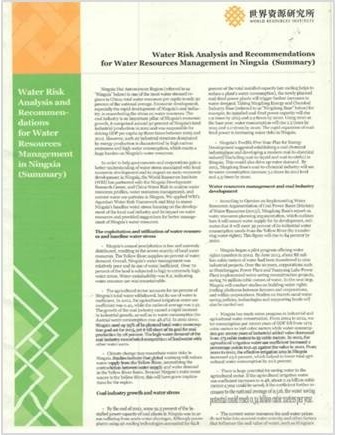 10 November 2015, the World Resources Institute (WRI) published the report, “Water Risk Analysis and Recommendations for Water Resources Management in Ningxia“. For this project, WRI partnered with China Water Risk and the Ningxia Development Research Center to analyse water resources profiles, water resources management, and current water use patterns in Ningxia province. Ningxia is one of the most water stressed regions in China but is also home to one of China’s largest coal bases, the Ningdong base. The energy industry is an important pillar of Ningxia’s economic growth but this means high carbon emissions and high water consumption, which is exacerbating the stress on the province’s water resources. Along with economic growth does coal always bring water stress? To answer this WRI investigated how Ningxia balances resources and whether there are ways to minimise water stress as well as developing coal. This report is aimed at helping governments and corporations gain a better understanding of water stress associated with local economic development and provides suggestions for better management of Ningxia’s water resources. For key findings from the investigation and suggested strategies to balance water and economic development see here. The full report can be accessed here and on WRI’s website here.